Hello everyone. My name is Milton Gaither. 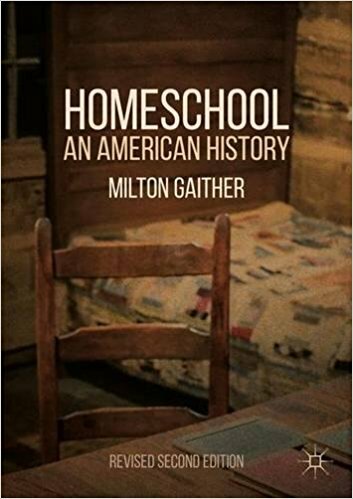 I’m a professor at Messiah College in Grantham, PA, and author of several works on homeschooling, the most important being my 2008 book Homeschool: An American History , which was was revised and updated for a 2017 second edition . I maintained this blog from March of 2008 to March of 2013. In 2012 and 2013 I copied most of the scholarly reviews I’d written of homeschooling research here over to another site, the reviews section of the International Center for Home Education Research website. Interested readers can find my more recent reviews there. Did (do) you homeschool your children? At present the oldest two of our four children are enrolled in a cybercharter, one is in second grade at the neighborhood public school, and one in kindergarten. We tend toward a pragmatic view of these matters–whatever seems to be best for each child given their individual circumstances. Our eldest daughter, for example, is involved in a very intensive ballet program in Carlisle, PA and was accelerated two grades in school because of her high test scores. For both of those reasons she and we decided together that homeschooling would be the best move for now. We also decided together that the cybercharter would be best for her because she likes the curriculum and especially the extra activities (leadership retreats on college campuses, field trips with other enrollees, etc.). My name is John Press. I am a doctoral student in the History of Education Department at New York University. Your American Educational History Revisited is a very important and beautiful work. Our dismissal of our predecessors and progress harms the profession immensely. It likely harms our nation too. Your work should be required reading in every educational history program. Hello. I homeschool my three kids here in Charlottesville, VA, and I’m so very glad to have stumbled upon your blog! You do a truly commendable job of even-handedly summariing, contextualizing and critiquing the articles and resarch you cover. Thanks very much for this valuable service. I will check in often, and have passed the link to your blog on to our local (450 families) homeschooling group members. Elizabeth told me at lunch today to look up your blog, and I’m impressed! I was laboring under the delusion that “research” showed that, now that there’s been a generation of people who have been through homeschooling, they’ve turned out to be more confident and better able to function in variety of new situations. Elizabeth set me straight straight away. I find it really intriguing that some of the most intelligent, accomplished, well-educated women I know have turned to homeschooling (and not for religious fundamentalist reasons), including Jenny, Lisa, Karin, and of course, Elizabeth. Elizabeth also tells me I should buy your book, which I will do if you promise to autograph it. My wife and I turned to home schooling upon the birth of our first child in 1980, before we knew there was anyone else out there doing it. We made the decision because we knew God would ultimately hold us, not the state or the church, responsible for the rearing of our children; thus, our reason was “religious.” I recognize that there are legitimate “non-religious” reasons for turning to home education, but I find it narrow when some don’t recognize religious, even fundamentalist, motivations as legitimate impulses for making decisions about the education of children. Do only non-religious motivations count? Perhaps religiously motivated people should not be allowed to rear their children, or vote, as one of my colleagues here at Emory suggested. Delighted to discover your blog, Milton. It’s time to add it to my standard reading list. Glad you found it Scott! Comment any time! Whoa! You might be the most balanced, sane, and intelligent homeschooler I have ever run across. I… I… I… didn’t know that people like you existed. I am however, very familiar with the Casey Patrick Cochrans of this world. Enjoying your blog, looking forward to picking up a copy of your book as well. Best regards! While I appreciate the work you are doing on this subject I find that many sources such as yours concentrate on the Christian homeschooler or religious homeschooler. It is important to note that there is a growing community of secular homeschoolers in the US and abroad where it is legal that are equally important as a trend. I hope that you will work to document us as well as you do the religious homeschooler. Poochmom, I hear you loud and clear. My book talks at great length about the work of John Holt and many other leading homeschoolers who were not self-professed Christian conservatives. I describe how they laid the groundwork of the movement in the 1970s and early 80s, how they worked side by side with the growing numbers of religious conservatives in the mid-1980s, and how they were gradually eclipsed and in many cases elbowed out of the limelight by Christian conservatives once conservatives obtained numerical dominance. I describe the tensions that have existed among homeschoolers to this day over this issue. This is a major theme of my book. I just stumbled across your blog as a result of your response to the Robin West article — it makes for interesting reading indeed! I will be adding it to my blogroll. As a relatively new homeschool parent who has been researching educational philosophies extensively since embarking on this journey, I am looking forward to learning more about the history of the movement as well. on March 1, 2010 at 11:26 pm Kate S.
I found your blog through Dr. Kunzman’s blog and research. I am currently a Graduate Student at Indiana University (in the process of applying to the Curriculum Studies PhD program) – I homeschool our 6 year old and 4 year old; therefore, finding your work, as well as, Dr. Kunzman’s work very important. I am also referring to it in my final paper for a “curriculum theory” course. So far, I find both your work and Dr. Kunzman’s work very helpful. I would like to hear more about how your children’s educational experiences are going…I come from a diverse educational background (homeschooled for 3 years, public school and Catholic school for 3 years)…and tried out a year of public school with my daughter, worked as a substitute teacher, and now are using the Ohio Virtual Academy (curriculum supplied by http://www.k12.com and excellent in my opinion, I especially love the classical approach to history, which we enhance with Susan Wise Bauer’s “Story of the World” CDs from the library) for both our daughters. My son decided this year (7th grade) to go back to public school, largely to be with his friends and to play sports (PA law now allows homeschooled children to play sports and do other extracurriculars at their local school district, but he wanted to go back). There was an article written in “Christianity Today” a couple months ago that I cannot find. It addresses comparing public school, homeschooling and religious schooling for the high school level. Do you know anything about this article? Milton I am a single mother of a daughter that is 16. I have thought of homeschooling as she has 2 years left. Please tell me your thought as to homeschooling the last 2 years. Public school has taken its toll on her and not sure at this point if it will benefit. But would feel lots of gratitude for any information you are willing to share. Our eldest is 15 and is at home. We’ve found it very helpful for her, mostly for scheduling reasons. She can do her school work around her dance schedule, and she has been able to take many classes at a local college. Lots of kids who grew up homeschooled re-enter the school system at the higher grades for lots of reasons, but it can go in the other direction as well. I can’t give you generic advice–you’ll have to decide together what works best for both of you. If you live in a state that has them, virtual charter schools are an option you might consider as well–public school at home. My one piece of advice would be to get in touch with some of the local homeschooling support groups in your area to get the lay of the land a bit. There are usually many very experienced parents in these groups who will be very good at answering questions you may have. I found this site through a link at the Mythic America site at History News Network. I have a Ph.D in Foundations of Education from the University of Colorado. I homeschooled my daughter for a number of years, and I still do academic evaluations of homeschooled students to help them meet state law. It’s great to find another educational foundations person writing about homeschooling. My daughter (now an adult) and I have been talking about writing a book about all the interesting projects and activities of homeschooling families in our area, primarily as a way to inform potential homeschoolers, critics of homeschooling, and others about what homeschooling families actually do. I will bookmark your site and check back here periodically. It appears to be a gem of a site. Hi Milton, I landed here reading about Gatto and really liked your style of criticism, the point about making opponents arguments better than they can is great and I have never heard that one. “My doctoral dissertation ended up being a history of the discipline itself–a history of history of education, published in 2003 under the title American Educational History Revisited. Funny the topic turned to Calvinism on your Gatto post, I was brought up in an anti-intellectual, materialistic, and spiritually ignorant family, and went to School with undiagnosed ADHD-PI, and possibly a dash of autism on the side. It was not a recipe for “The American/Canadian dream” No amount of punishment could get me to sustain attention to the material that bored me into a stupor. In 10th grade English I was hauled out of class and accused of being “Stoned out of my mind every day” I was so under stimulated and bored that I looked drugged. So the materialistic dream eluded me, but I wound up getting out of the anti-intellectual, materialistic, and spiritually ignorant way of thinking that I grew up with. Oh what on earth does all this have to do with Calvinsim? I wound up with Kierkegaard for my teacher, and I have an interest in some of the critical views that some people have of SK. Strangely there is a pattern where secularists take his ideas without credit and praise Nietzsche (my sort-of other Teacher), and Christians credit him with negative influence that is completely slanderous. Irrationalist!? LOL! Because he was more interested in using his reason than making an altar unto it and burning incense? Oh yes Calvinism: well turns out there is a pattern where a lot of the negative assessments on SK seem to come from Calvinists or at least people associated with the reformed tradition, with Gordon Clarke and Francis Schaeffer being the most notorious as far as I know. Schaeffer seemed to make the mistake of trusting secondary sources (it seems unlikely he read any SK) but Gordon Clarke was just twisted. I am no SK scholar but I could clearly make out the obvious quilt-quoting in his lecture I heard. Quilt-Quoting the Magister of Irony? It was so disturbing I had to stop listening. The clown who put the lecture on youtube did not put my comment up 🙂 but he did let somebody say “Kierkegaard was a fool” Bunch of donkeys, but perhaps their education is partly to blame. I think you went to the School Stephen Crites taught at? I heard (from Hannay’s SK bio) he was another questionable and Possibly Kaufmannesque SK interpreter, but his books are pretty tough to find.